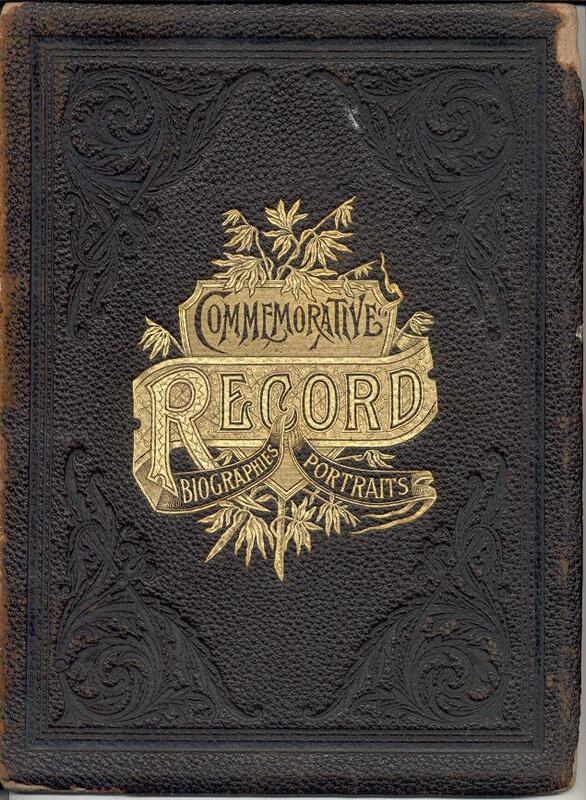 The book, "Commemorative Biographical Record of Dutchess County, New York, containing Biographical Sketches of Prominent and Representative Citizens, and of many of the Early Settled Families," J. H. Beers & Co., Chicago, 1897. It is a HUGH book dealing with the pioneers and residents of Dutchess County, New York. 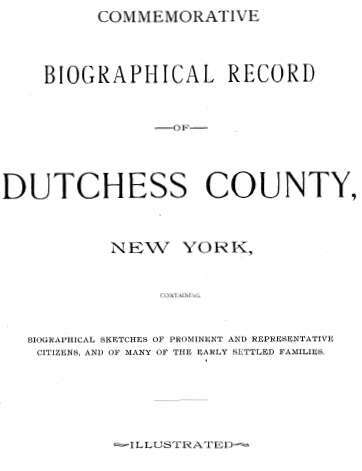 It is absolutely filled with genealogical and personal information about various Dutchess County residents. It has many illustrations of individuals. There are many biographical memoirs or sketches of individuals and families. The book has approximately 941 pages. 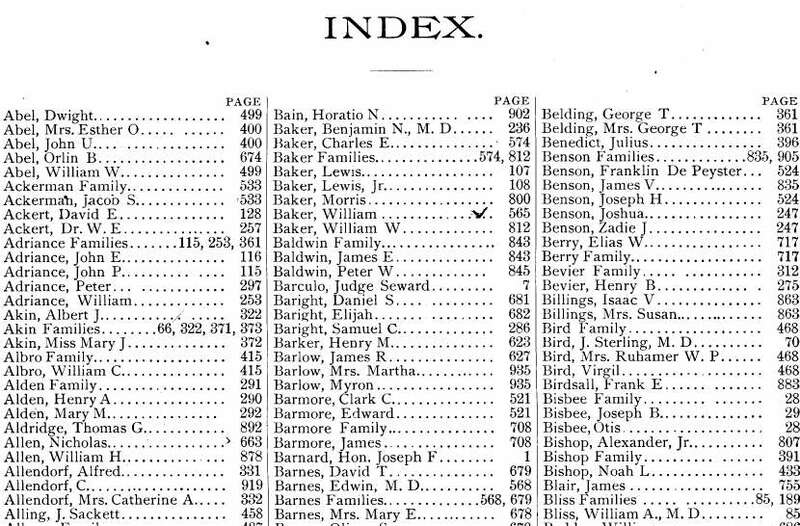 The book is fully indexed, but the Index is not linked - you can search the book using the Adobe Reader 'search' function or manually browse to the pages indicated by the Index. Please note: This is not a paper book, it is a scan of the original paper book into the digital Adobe PDF format, written on a CD-ROM. You read this book on your computer using the free Adobe Reader software. It is a digital version of a hard to find book. If you could find a copy of the 1897 printed book, it would be very expensive. Dwight Abel, Esther O. Abel, John U. Abel, Orlin B. Abel, William W. Abel, Jacob S. Ackerman, David E. Ackert, W. E. Ackert, John E. Adriance, John P. Adriance, Peter Adriance, William Adriance, Albert J. Akin, Mary J. Akin, William C. Albro, Henry A. Alden, Mary M. Alden, Thomas G. Aldridge, Nicholas Allen, William H. Allen, Alfred Allendorf, C. Allendorf, Catherine A. Allendorf, J. Sackett Alling, Henry E. Allison, John P. Ambler, A. Butler Anderson, John P. Anderson, Peter Anderson, A. B. Andrews, Charles C. Andrews, George H. Angell, Milton H. Angell, Theodore Anthony, William C. Armstrong, Charles W. H. Arnold, Charles W. Arras, Emma A. Arras, Edward S. Atwater, John P. Atwater, George S. Aucock, & DeWitt C. Ayres. W. H. Badeau, William E. Badgley, Jacob Bahret, John J. Bahret, Ferdinand R. Bain, Horatio N. Bain, Benjamin N. Baker, Charles E. Baker, Lewis Baker, Morris Baker, William Baker, William W. Baker, Lewis Baker, Jr., James E. Baldwin, Peter W. Baldwin, Seward Barculo, Daniel S. Baright, Elijah Baright, Samuel C. Baright, Henry M. Barker, James R. Barlow, Martha Barlow, Myron Barlow, Clark C. Barmore, Edward Barmore, James Barmore, Joseph F. Barnard, David T. Barnes, Edwin Barnes, Mary E. Barnes, Oliver S. Barnes, Oliver Weldon Barnes, Andrew Barnum, John D. Barnum, E. Lathrop Barrett, John R. Barrett, Oliver Barrett, John C. Barringer, Ralph A. Bartholomew, Sanford J. Bartlett, William H. Bartlett, Anthony H. Barton, Artemas S. Barton, Lewis B. Barton, Elizabeth D. Bartow, Moncure Bartow, Joseph Bates, Charles G. Baumann, Guy C. Bayley, William J. Beardsley, Alex R. Becker, Nathan Beckwith, William S. Beckwith, William Bedell, Edward H. Bedford, John Bevier Bedford, Hiram T. Beecher, Darwin Beers, George T. Belding, Julius Benedict, Franklin De Peyster Benson, James V. Benson, Joseph H. Benson, Joshua Benson, Zadie J. Benson, Elias W. Berry, Henry B. Bevier, Isaac V. Billings, Susan Billings, J. Sterling Bird, Ruhamer W. P. Bird, Virgil Bird, Frank E. Birdsall, Joseph B. Bisbee, Otis Bisbee, Noah L. Bishop, Alexander Bishop, Jr., James Blair, William A. M. D. Bliss, William Bodden, Henry Bodenstein, John G. Bodenstein, Abraham A. Bogardus, William Bogle, John H. Boice, Nelson L. Boice, Henry Bolenbaker, Gaius C. Bolin, Arthur H. Bolles, Alfred Bonney, George H. Bontecou, Albert F. Booth, Oliver H. Booth, William F. Booth, Perry Borden, Frederic Bostwick, William Bostwick, Charles E. Bowne, Frederick Bowne, Charles E. Boyce, Nathan T. Boyd, Edward Braman, H. V. V. Braman, Abraham Brett, Albert V. Brett, Harvey Brett, Benjamin H. Brevoort, Thomas J. Brevoort, William A. Brewster, Anthony Briggs, Davis W. Briggs, George G. Briggs, George H. Briggs, Hannah Briggs, Hiram H. Briggs, Homer E. Briggs, Stephen D. Briggs, Aiken T. Brill, John H. Brinckerhoff, William E. Brinckerhoff, William H. S. Brinckerhoff, John J. Brooks, Norman J. Brooks, William J. Brooks, Douglass Brown, Edwin Brown, Frank D. Brown, George Brown, Samuel Holmes Brown, Samuel H. Brown, Sebastian Brown, William J. Brown, Alton Brundage, Charles W. Brundage, ________ Brush, David Bryan, Isaac Bryan, Mary Bryan, Albert R. Bryant, Evan Bryant, Samuel Bryant, Charles H. Buckingham, Miles Buckley, Albert J. Budd, Joel N. Budd, Mary J. Budd, Underhill Budd, William D. Budd, J. N. Bullis, James D. Burgess, Peter Burhans, Frank E. Burnett, Stephen R. Burnett, Frank Burroughs, Edwin L. Bushnell, Edmond Butler, Robert D. Butler, Allison Butts, John W. Butts, Richard S. Butts, & Thomas Butts. Theron H. Caldwell, Emeline C. Campbell, Henry L. Campbell, John Campbell, Arnout Cannon, Cornelius L. Cannon, George W. Cannon, Arnout Cannon, Jr., Colvin Card, Edson Card, Silas E. Card, Charles A. Care, William J. Carey, Leonard L. Carman, Lewis Carman, Isaac S. Carpenter, J. Du Bois Carpenter, William J. Carpenter, James Carroll, William Carroll, Mary Cary, Richard B. Cary, Hannah M. Case, Willia Haviland Case, Matthew J. Cashin, Robert Cass, James Stuart Chaffee, George B. Chapman, George T. Chapman, Hiram W. Chapman, Jame M. Chapman, Augusta H. Chase, Enos J. Chase, George W. Chase, Lewis H. Chase, Henry Chatterton, Clinton W. Clapp, Carrie D. Clark, Edgar Clark, Edward Lee Clark, Elizabeth Clark, Henry Clark, Hiram Clark, John W. Clark, Annie Clifford, Henry Clifford, Albert Cline, Charles A. Cline, Franklin Cline, George H. Codding, Hezekiah R. Coffin, Robert Coffin, Robert G. Coffin, Tristram Coffin, Valentine Coffin, Andrew Cole, Charles N. Cole, David Cole, Emery Cole, Mortimer B. Cole, Amasa D. Coleman, Elizabeth Coleman, Joseph D. Coleman, ______ Collier, Eli H. Collin, James Collingwood, Mary E. Collingwood, Joshua Collins, Martin W. Collins, Charles M. Colwell, David E. Colwell, Frank W. Colwell, Elizabeth Conklin, George W. Conklin, Isaac P. Conklin, John H. Conklin, J. Mulford Conklin, Storm H. Conklin, William J. Conklin, Evritt Conover, Peter Conover, Edward J. Conroy, James Hervey Cook, Griffin Cookingham, Gilbert Cooper, John Cooper, Tunis Cooper, Albert W. Corbin, Asa B. Corbin, Isaac Corbin, John Corcoran, Virtus H. Cornelius, Adrian M. Cornell, Isaac M. Cornell, Peter M. Cornell, Azariah Cornwell, Frederick J. Cornwell, Charles F. Cossum, John Cotter, John H. Cotter, Edward Couse, James Cowl, Orlando J. Cowl, John H. Cox, Eugene S. Craft, Margaret Craft, Rufus S. Craig, George E. Cramer, George H. Cramer, William C. Cramer, Abram B. Crapser, Robert F. Crary, George W. Cronk, Sarah E. Cronk, Edward Crummey, Safford A. Crummey, Thomas K. Cruse, Ambrose M. Culver, Walter B. Culver, Court B. Cunley, Thomas J. Cunningham, Herbert J. Curtis, Charles G. Cutler, Theron Cutler, & Henry D. Cypher. George Dakin, William Dakin, William E. Dalrymple, ______ Dana, William Augustus Davies, John Davis, Charles Davis, Orville L. Davis, Willard H. Davis, William L. Davis, Charles H. Davis, Jr., J. G. Dawson, David S. De Garmo, James M. De Garmo, Smith L. De Garmo, William L. De Lacey, J. Watts De Peyster, James E. Dean, Willis Dean, William J. Dedrick, Eliphaz Delamater, ______ Dennis, Abram A. Denton, Amos Denton, Judson A. Denton, Nelson Denton, Isaac N. Deuel, Phoenix N. Deuel, Stephen T. Deuel, Wright Devine, Hugh Diamond, William H. Diamond, Warren S. Dibble, Benjamin E. Dickhaut, Jonathan Dickinson, C. Gray Dinsmore, William B. Dinsmore, Anna E. Dodge, William Dolan, Jessie F. Donald, John Donald, Cyrenus P. Dorland, John M. Dorland, A. M. Doty, Egbert Doty, Charles Doughty, George T. Doughty, Hannah Doughty, Mary E. Doughty, Phebe J. Doughty, John G. Doyle, George W. Draper, John H. Draper, David C. Drislane, Garret Du Bois, John C. Du Bois, Edward B. Du Mond, Alexander H. Dudley, James H. Dudley, Charles H. Duncan, John B. Duncan, John G. Duncan, Allen H. Dutcher, George W. Dutcher, James E. Dutcher, John Dutcher, John B. Dutcher, J. 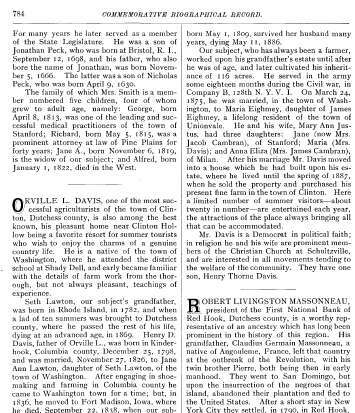 Van Ness Dutcher, Joshua Dutcher, Luzerne Dutcher, May Losee Dutcher, & Sarah A. Dutcher. Harvey G. Eastman, Franklin S. Eastman, Lewis F. Eaton, Frank M. Edmond, Edward Elsworth, Luther Elting, Albert S. Emans, Storm Emans, Thomas W. Embley, Thomas Emerson, Edward Englehardt, James R. English, Frank Eno, John H. Ensign, & George Esselstyn. Frederick A. Faust, John Faust, Louis Feierabend, Nathan Feller, Martin Fendel, George Feroe, Jacob H. Feroe, Elmore Ferris, Joseph Field, T. R. Field, William H. Fiero, James Finch, John H. Fink, John Flannery, Charles L. Fletcher, Charles A. Flint, Mary F. Foote, George Benton Foote, Sr., Robert Forster, Benjamin M. Fowler, Charles E. Fowler, Gilbert Fowler, Eugene Fox, George W. Fraleigh, Irving Fraleigh, John A. Fraleigh, John B. Fredrick, Harvey J. French, Joseph G. Frost, Benjamin H. Fry, & Peter W. Funk. Edward M. Goring, John M. Goring, Thompson E. Goring, Le Grand Graham, Augustus B. Gray, Robert M. Greene, ______ Gregory, Charles H. Griffen, Corneliue Griffen, Jacob Griffen, Timothy S. Griffen, James C. Griggs, D. W. Guernsey, & Stephen G. Guernsey. John Hackett, James M. Hadden, David V. Haggerty, Abram V. V. Haight, Andreas V. Haight, Arvis Haight, Charles Haight, Clement Haight, Cornelius J. Haight, Emily R. Haight, Emmer J. Haight, Frances Haight, Franklin L. Haight, Isaac Haight, James B. Haight, James H. Haight, J. Cornelius Haight, J. Haviland Haight, Sherman N. Haight, William H. Haight, Isaac Haight, Jr., ______ Haines, Alfred E. Hall, Alfred P. Hall, Edward J. Hall, Israel Hall, John J. Hall, Leonard D. Hall, Platt V. Hall, Priscilla Hall, William Hall, George S. Halsted, Julia Halsted, Nehemiah Halsted, Eugene Ham, Benjamin Hammond, John L. Hammond, David Hanna, John A. Hanna, Irving Hapeman, Joseph D. Harcourt, Mary E. Harcourt, Smith D. Harris, William H. Hart, Charles F. Hasbrook, Albert R. Haskin, Alex Haskins, John M. Haskins, Samuel Hastings, William Haubennestel, John Haupt, Edward E. Havens, William E. Havens, Barclay Haviland, Isaac Haviland, Maria Ann Haviland, Cyrus F. Hawley, William W. Haxtun, Ann A. Hayes, Peter B. Hayt, Charles S. Heaney, Newton Hebard, Lewis D. Hedges, Mary Hedges, Martin Heermance, Allan B. Hendricks, Edmund L. Hendricks, Magdalene A. Hendricks, Charles B. Herrick, Ephraim Herrick, Frank Herrick, James Herrick, John A. Herrick, Marshall Herrick, Timothy Herrick, William Herrick, Isaac S. Hewlett, Campbell N. Hicks, Edward S. Hicks, Samuel S. Hicks, Willard W. Hicks, James H. Hignell, Winfield B. Hinman, ______ Hiserodt, Arabella Hoag, Arthur F. Hoag, Charles W. Hoag, Laura B. Hoag, Philip Hoag, William P. Hoag, Ernest Hochstadter, Frank Hoffman, Henry Hoffman, John W. Hoffman, Lydia Hoffman, Mary A. Hoffman, Nicholas Hoffman, Theodore A. Hoffman, Augustus Holdridge, Gilman D. Holmes, Henry A. Holmes, Wheeler C. Holmes, William C. Holmes, Benjamin Hopkins, Charles A. Hopkins, John Hopkins, William H. Hopkins, Richard C. Horton, Theodore S. Horton, Frank A. Hotchkiss, Beverly W. Howard, John D. Howard, Sherman Howard, Silas Howard, Benjamin Howell, Eugene N. Howell, Frank Howell, George W. Howell, Anna C. Howell, George Hufcut, Horace D. Hufcut, Jennie Hufcut, George Hughes, Miles Hughes, Walter C. Hull, George E. Humeston, John J. Humeston, Merritt Humeston, Abram S. Humphrey, John V. Humphrey, Abner G. Hungerford, Robert J. Hungerford, George Huntington, Adolph G. Hupfel, Robert Hurd, Dewitt C. Husted, George L. Husted, Jackson Husted, Henry H. Hustis, Robert Hutchison, & William B. Hutton. 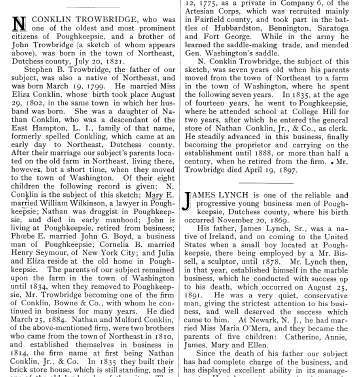 George W. Ingraham, Thomas Ingraham, AaronInnis, George Innis, Elmira A. Ireland, Stephen H. Ireland, & Abraham W. Irish. Sarah M. Jaycox, Thomas W. Jaycox, William H. Jaycox, Horace Jenks, John F. Jewell, Mary Adams Johnston, Robert Johnston, Josephus D. Jordan, William B. Jordan, Edwin Juckett, George B. Juckett, Thomas S. Judson, & John M. Julian. Louis E. Kampf, Simon J. Kelder, Terrence F. Kelly, Timothy G. Kelly, Edward D. Kelsey, James Kerley, James R. Kerley, Andrew J. Ketcham, George W. Ketcham, John H. Ketcham, John M. Ketcham, Mary E. Ketcham, Richard P. Ketcham, Charles Ketterer, DeWitt C. Ketterer, George W. Kidder, Mary Kimlin, William R. Kimlin, George B. Kinney, Clark Kirby, Frances Kirby, Charles Kirchner, Lena Klady, Philip Klady, Joseph Kline, David A. Knapp, Edwin Knickerbocker, Henry Knickerbocker, Henry B. Knickerbocker, & August Koch. John N. La Due, Joseph T. Lamb, Addie H. Lambert, John H. Lambert, George Lamboree, Edmund N. Landon, John S. Landon, Charles E. Lane, Wellington C. Lansing, Almira J. Lasher, Frank P. Lasher, Martin Lasher, Warren S. Lasher, Frank	Latson, Henry Latson, Casper Lawson, Robert P. Lawson, Irving D. Le Roy, Alonzo M. Leach, Lilius C. Leach, Martin Leach, P. Alverson Lee, Darius Lee, George F. Lee, George J. Lee, Mary Lee, Ward Lee, William Morgan Lee, Samuel Leith, Sr., Miles K. Lewis, John W. Link, _______ Livingston, George Lockwood, James H. Lovelace, Frank B. Lown, Charles P. Luckey, Charles L. Lumb, George W. Lumb, J. Hyatt Lyke, John Lyke, James Lynch, M. J. Lynch, SamuelLynch, Asahel A. Lyon, Asahel D. Lyon, & Leonard Lyon. Hiram Mabie, Crawford C. MacNeil, Cornelius V. Mahoney, Edward B. Manning, Samuel Mansfield, Marcus D. Marcy, Joaquim Marill, John F. Marquet, Henry S. Marshall, James A. Marshall, John A. Marshall, Theron R. Marshall, William W. Marshall, Willet J. Marshall, Augustus Martin, Claudius G. Martin, Elizabeth B. Martin, James H. Martin, Joseph Martin, Serena Martin, Wing J. Martin, Robert L. Massonneau, Robert Matthews, James C. McCarty, John McGlasson, Robert McGlasson, John J. McGrath, John McKevitt, Thomas McWhinnie, Frank P. Mead, Isaac N. Mead, James V. Mead, Jeremiah Mead, Morris Mead, Douglas Merritt, E. M. C. Merwin, William J. Merwin, H. D. Millard, Howard C. Millard, John Millard, L. D. Millard, William B. Millard, George N. Miller, Peter Miller, Philip Miller, Valentine M. Miller, John Mitchell, August T. Moith, J. Edgar Moith, Margaret Monahan, Thomas Monahan, John A. Monfort, Daniel H. Monks, Peter V. W. Montfort, Alfred L. Moore, David V. Moore, William R. Moore, Charles C. More, Henry S. Morehouse, Julius Morehouse, Edmond A. Morey, Leonard L. Morey, Sarah Morey, Charles B. Morgan, George Morgan, Julia A, Morgan, Levi P. Morton, William A. Mosher, Morgan L. Mott, Morgan L. Mott, Jr., Julius M. Moul, Joseph H. Mulcox, Michael A. Muldowney, Edmund D. Mulford, James E. Munger, Polhemus W. Myer, John Francis Myers, & Henry Mygatt. George Nagengast, Cornelia M. Nelson, Homer Augustus Nelson, Jeannette Nelson, John P. Nelson, Joseph Nelson, Sarah C. Nelson, Thomas Henry Nelson, James Newman, Thomas G. Nichols, James Nilan, George S. Norton, & Matilda V. Noxon. Thomas O'Brien, Casper L. Odell, Edward Odell, Samuel D. Odell, Joseph E. Odell, Wright Odell, John V. O'Farrell, John H. Orton, Alson Ostrander, James H. Ostrander, John C. Otis, & George W. Owen. James Russell Paine, Martin W. Paine, Platt N. Paine, Abiah Palmer, Edward Hazen Parker, Nathaniel Parker, William H. Parker, George E. Parks, John H. Parmele, William Parmele, Emil Parmenter, ______ Pawling, George C. Payne, Samuel Payne, Arthur S. Peacock, Benoni Pearce, Henry Pearce, Jeremiah Pearce, Cornelia M. Pease, Edwin Pease, George Peattie, _______ Peet, Michael Pells, ________ Pendleton, Charles H. Perkins, Cyrus F. Perkins, Edward Perkins, J. A. Perkins, Sarah Perkins, Stephen Perkins, Ludwig Petillon, George Phesay, David Phillips, Joseph Phillips, Samuel K. Phillips, William T. Phillips, Isaac Pierce, Leonard V. Pierce, Charles W. Pilgrim, James Pinckney, Lewis Pinckney, Perry Pinckney, James O. Pingry, Anson Plass, Edmund Platt, Isaac Platt, John I. Platt, William B. Platt, William Platto, James G. Porteous, J. Wilson Poucher, Horace Powell, John Powers, Wladyslawa J. Pralatowski, John Pratt, Peter Pratt, Hamilton Pray, Ebenezer Preston, Ebenezer J. Preston, James L. Prichard, Hiram Pultz, M. T. Pultz, Herman Pulver, John W. Pulver, John W. Putnam, Amelia S. Pye, & Francis Pye. Lawrence C. Rapalje, E. S. Raub, William Record, Charles Redavats, John Redman, Thomas Reed, James Reynolds, Justus Reynolds, Warren Reynolds, William T. Reynolds, Valentine Rickes, Albert Rider, John P. Rider, R. Raymond Rikert, Charles H. Roberts, Chappell Robinson, Francis M. Robinson, Jarvis C. Robinson, Osborn Robinson, Reuben Robinson, Stephen Robinson, Clinton Rockefeller, Arthur V. Rockwell, Ralph Rockwell, Amanda A. Roe, John Roe, William B. Roe, William P. Roe, George Roger, Charles D. Rogers, D. W. Rogers, Margaret Rogers, Patrick Rogers, Philip Clayton Rogers, James Roosevelt, Frederic L. Rosa, Hyman Rosa, Duncan Ross, Mary H. Ross, Charles I. Round, Julius Rowe, James Roy, William K. Roy, Joseph Rozell, Zebulon Rudd, David Rundall, Henry Rundall, Samuel Rupley, Benjamin H. Russell, James H. Russell, Selwyn Russell, Edward Rymph, & George Rymph. Nathan C. Sackett, Samuel Sackett, Smith J. Sackett, James Edgar Sadlier, Robert Sanders, Robert Sanford, Winthrop Sargent, Louis Schafer, George Schlegel, George Schlude, Richard A. Schouten, Jacob Schrauth, John T. Schryver, Matthew V. B. Schryver, Charles E. F. Schubert, John Schultz, Miles Scofield, Stephen Scofield, John Scutt, Thomas H. Seaman, Charles Segelken, Charles E. Seger, John Sencerbaugh, W. P. Sencerbaugh, James A. Seward, Mary B. Seward, _______ Sexton, George R. Shaw, Edmund Sheaff, Catherine L. Shear, John Cornell Shear, Daniel M. Sheedy, Augusta B. Sheldon, Collins Sheldon, Jeremiah Sheldon, William H. Sheldon, Wilson Sheldon, Alva Shelley, Charles Sherman, Mary A. Sherman, Rhoda L. Sherman, Walter A. Sherman, Isaac W. Sherrill, Charles Sherwood, Sheridan Shook, William Shook, Charles Shurter, John C. Sickley, George Sievers, Charles Simmons, Edward W. Simmons, James B. Simmons, Peter Skidmore, Samuel Slee, Alexander W. Sleight, Benjamin A. Sleight, Charles H. Slocum, Hiram Slocum, Abel Smith, Albert C. Smith, Alfred B. Smith, Andrew C. Smith, Cassius M. C. Smith, Charles E. Smith, Charles Hoag Smith, Edward M. Smith, Frances Smith, George C. Smith, George W. Smith, John T. Smith, Lewis Smith, M. J. Smith, Myron Smith, Nathan Smith, Nathan W. Smith, Nathaniel Smith, Oliver Kees Smith, Slias G. Smith, W. Wallace Smith, John H. Smith, Jr., Burton A. Snyder, Gertrude M. Snyder, John W. Spaight, John J. Spaulding, Elias Spross, ______ Squires, Charles A. Stephens, Hiram G. Stevens, George Stevenson, Philip Stickle, Aaron Stockholm, A. B. Stockholm, Carrie Storm, Charles A. Storm, George Storm, Joseph Storm, Thomas I. Storm, Walter G. Storm, William Storm, Wilson Storm, ______ Stoutenburgh, Charles Stowe, C. N. Stowe, ______ Straight, Lewis Streit, Rebecca Streit, Adam Strever, Frederick Strever, Rachel T. Strever, Christina Strobel, Wendel Strobel, Walter D. O. K. Strong, Robert Stuart, Ebenezer Sturges, Joseph Sunderland, Eli Sutcliffe, John Sutcliffe, Josiah Sutherland, Robert Sutherland, Edwin Sutton, Leslie A. Sutton, Mary D. Sutton, Pedro Sweet, George Swift, Henry Swift, Isaac Swift, James Swift, James H. Swift, Jane Swift, John Swift, & Richard Swift. George K. Taber, Thomas Taber, Walter Taber, William Taber, Gilbert Tabor, Myron Tabor, Benjamin Talbot, Frank Talladay, John Tallman, John P. H. Tallman, Samuel Tanner, William Tanner, Catherine E. Taylor, Henry Taylor, H. Pauline Taylor, John Teal, Uriah Teator, Frank Teats, Samuel ten Broeck, Samuel P. ten Broeck, Walter ten Broeck, Silas Terwilliger, Frank L. R. Tetamore, Robert Thomas, Walter Thomas, Caroline B. Thompson, Edward H. Thompson, John Thompson, John R. Thompson, Robert R. Thompson, William Thompson, Henry Tiedje, Arthur R. Tiel, John Tiemeyer, Francis Timoney, Cleveland H. Titus, Harriet Titus, Richard Titus, Robert Titus, Willet Titus, Arthur Tobey, John Toffey, E. Lakin Tompkins, Franklin C. Tompkins, Helen E. Tompkins, Jane Tompkins, Lewis Tompkins, Charles Townsend, Jacob S. Townsend, William Trafford, Edwin Traver, Herbert Traver, John A. Traver, Mary J. Traver, William Traver, B. F. Treen, Alfred Tripp, Carrie Tripp, Charles H. Tripp, D. C. Tripp, James B. Tripp, Leonard Tripp, Smiten Vincent Tripp, William Tripp, George Trowbridge, John Trowbridge, N. Conklin Trowbridge, Stephen Trowbridge, & Robert K. Tuthill. Anthony Underhill, Edward Underhill, George Underhill, & Joshua Underhill. Edwin Vail, George Vail, Joseph Vail, Morgan L. Vail, J. Watson Vail, Willard C. Vail, Richard Valentine, Henry Van Benshoten, Mary J. Van Benshoten, James S. Van Cleef, Samuel Van Cott, Daniel Van De Bogart, Hexton Van De Burgh, George Van De Water, William Van De Water, Frank Van Dyne, Cornelius S. Van Etten, Acmon Van Gieson, Baltus Van Kleeck, Charles Van Kleeck, Cornelia Van Kleeck, Frank	Van Kleeck, James Van Kleeck, John H. Van Kleeck, Leonard Van Kleeck, Francis Van Nostrand, John Van Tassell, J. Wesley Van Tassell, Benson Van Vliet, ______ Van Vorhees, Benjamin Van Wagner, Cornelia B. Van Wagner, Egbert Van Wagner, Gilbert Van Wagner, Millard Van Wagner, Nicholas Van Wagner, Alfred Van Wey, Benjamin Van Wyck, Charles J. Van Wyck, Cornelius Van Wyck, David Barnes Van Wyck, Duryee Van Wyck, Henry D. Van Wyck, James Van Wyck, John Van Wyck, Phoebe Van Wyck, Sarah	Van Wyck, Stephen Van Wyck, T. De Witt Van Wyck, Theodorus Van Wyck, James Vander Burgh, Edgar Vanderburgh, Isaac Varian, Isabel Varick, Richard A. Varick, ______ Velie, Robert Ver Planck, Addison Vermilyea, Brooks Vermilyea, Samuel Verplanck, Edgar Vincent, George Vincent, M. Ella Vincent, Obed Vincent, Phebe Vincent, Reuben Vincent, & Isaac Vincent, Sr.
Mulford Wheeler, Obed Wheeler, Perry Wheeler, Theodore Wheeler, Benjamin White, Frederick White, Henry D. White, Howell White, John B. White, John L. White, William A. White, William H. White, J. O. Whitehouse, ______ Wilber, D. W. Wilbur, Frank B. Wilbur, Ira E. Wilbur, Alfred S. Wiley, Reuben Wiley, Robert F. Wilkinson, George H. Williams, James L. Williams, John Williams, Phebe Williams, George T. Willson, Israel Willson, John P. Wilson, Alonzo Wiltse, Joel S. Winans, Walter Winans, Virgil Winans, Milo Winchester, Ebbe Wing, Emery Wing, John S. Wing, Jackson Wing, Martha Wing, Obed Wing, Phoebe Wing, Sheldon Wing, John O. Wixom, Charles Wolcott, Isaac Wood, James M. Wood, Lewis E. Wood, William J. Wood, Daniel Woodin, Egbert Woodin, Mary J. Woodin, Solomon Woodin, Frederick Wormsley, Henry Worrall, Abram Wright, Charles W. Wright, Isaac Wright, James H. Wright, John G. Wright, Lewis H. Wright, Thomas Wright, & Luke D. Wymbs. H. J. Yeomans, Mary J. Yeomans, Clarence E. Young, Henry L. Young, & Louis Young.